this was shot hand-held with my 300mm. i was lying on the pool deck (wearing rain gear). there was nothing easy about getting this shot. 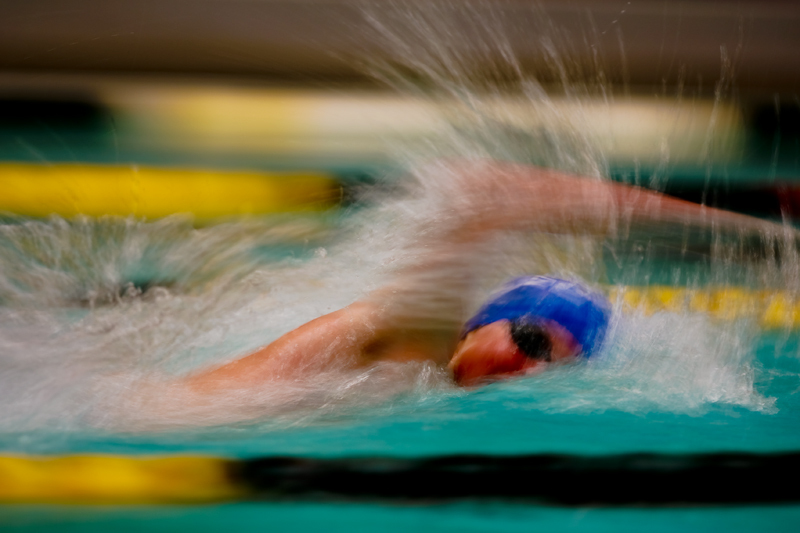 it's nearly impossible to pan swimmers with a lens this large because they just aren't moving that fast. it's purely random whether or not they are going to take a breath facing you at the moment they are passing through your view point. it's absolutely miraculous that the water is going to be doing anything interesting. i was only able to get 90 frames, which yielded only 10 possibles, which really came down to only three, of which i picked this one. post-production was essentially levels, curves, and hue-sat adjustments. since this is one of the few times a year where my work intersected with a dpc theme, i'm entering it. not really expecting this to connect with the mainstream, but i'm sure a few people will like it. Beautiful capture of the power and grace of swimming! We had a kid who swam competitively for 16 years. Not easy stuff. Love it when hard work pays off. Congrats on the high placement. great composition, really good capture. Great subject for this challenge, and good timing as well. I believe I would have liked it ever so slightly more if the swimmer were a bit sharper, but it's still nice. Anything with a swimming gets an extra vote from me. Love it. Very nice capture. It almost looks like a painting. Great job. like the blur here and the lovely colors. I had the same idea ! Really powerful. I love this. The water is brilliant. The lighting though seems just a tiny bit flat, so maybe a TINY bit more contrast would add a little bit of pop. Proudly hosted by Sargasso Networks. Current Server Time: 04/24/2019 03:52:56 PM EDT.